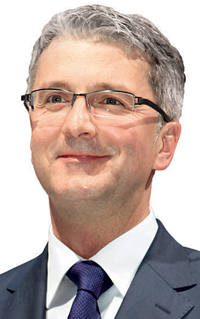 Audi CEO Rupert Stadler: "It would be negligent not to think about the team line-up." FRANKFURT (Reuters) -- Volkswagen's Audi division is looking into a management reshuffle as it eyes an expansion in China, Latin America and the United States, the unit's CEO Rupert Stadler told a German magazine. "Against the backdrop of Audi's 'Strategy 2020' it would be negligent not to think about the team line-up," Stadler told WirtschaftsWoche in an article published Monday. There were "of course" discussions about organization and structure in this context but decisions have not yet been taken, he added. Two company officials told Reuters earlier this month Audi is planning a broader management reshuffle as two executives are destined to quit the luxury carmaker's leadership panel. Stadler told WirtschaftsWoche Audi wants to raise output in China to 700,000 vehicles per year in the medium term, while building a new factory in Mexico and growing massively in the United States and Latin America.